The Architecture + Design Museum (A+D) in Los Angeles is continuing a recent tradition of simultaneous exhibition openings this weekend as it hosts the third Assembly extravaganza with the aim of ”join[ing] together a diverse group in celebration of different disciplines of design and points of view.” Taking place Saturday evening, the opening celebration will usher in four new exhibitions at A+D, including a “disgusting food museum” as well as the premiere of the museum’s so-called “impermanent collection,” a rotating set of artworks and products created by exhibited artists that will be for sale. 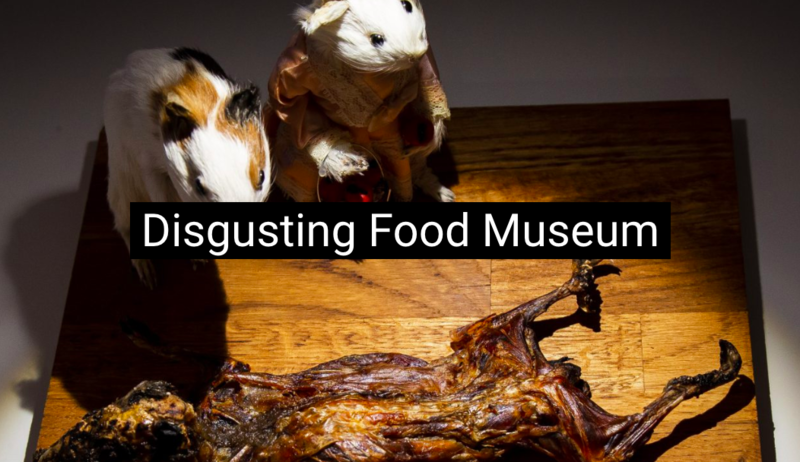 Disgusting Food Museum The museum will host the Disgusting Food Museum, an exhibition from Sweden that “explores of the concept of disgust through different culturally and individually informed reactions” and includes displays of delectable treats like mouse wine, Jello pudding, and other specialized foods. Alley Fellowship A+D recently undertook a partnership with architects Rios Clementi Hale Studios that is focused on supporting cross-disciplinary emerging artists through the Alley Fellowship. The first series is titled Volume, and features the work of young artists from the Leimert Park neighborhood—where RCH Studios’s new offices are located—who have been challenged to think three-dimensionally about their work. PERSISTENT: Evolving Architecture in a Changing World Presented in conjunction with the Open Building For Resilient Cities Conference, PERSISTENT: Evolving Architecture in a Changing World, focuses on the way in which “robust, sustainable, and resilient architecture can be obtained and studied with respect to time.” The exhibition is curated by Michelle Laboy, David Fannon, and Peter Wiederspahn with the support of the AIA Latrobe Prize and the Northeastern University, College of Arts, Media and Design. Dark Mode Artist and architect P810 will present an “eerie take on Dark Mode, which takes as its premise the visual digital standard of ‘dark mode’ becoming part of the home.” The design collection imagines new sculptural realities for typical objects of the home, according to a press release, including objects that come alive when they are switched off. For more information on each exhibit please visit the A+D website. Rios Clementi Hale Studios (RCHS) plans to transform Houston’s Jones Plaza from a sterile concrete jungle into a verdant, multi-functional space for locals and visitors to enjoy. The 1.5-acre design concept called “Urban Choreography” aims to embody the charm and appeal of Houston’s celebrated Theater District. 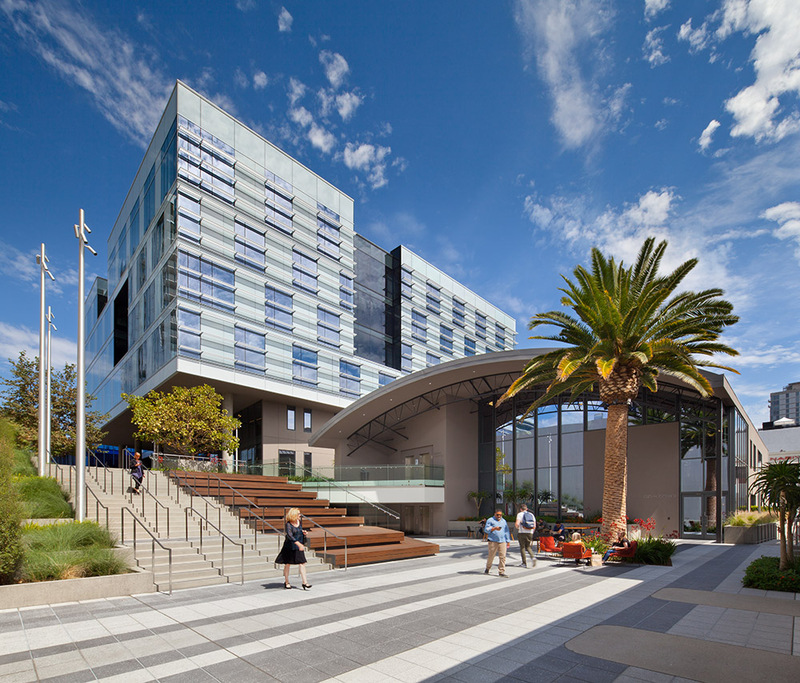 With the growing number of workers, residents, and visitors to the area, there has been an increasing demand for pedestrian and transit-friendly environments with an abundance of green and open space. “Within Downtown, the Theater District and its many venues create a ‘magnetic field’ of culture that generates buzz and catalyzes investment in the surrounding neighborhoods,” RCHS said in a statement. “Jones Plaza, at the epicenter of the Theater District, can provide an inviting green oasis that enhances downtown life and it can flexibly accommodate a wide range of outdoor performances and special events that serve the entire region.” Inspired by the fluid, dramatic, and theatrical movements of the performing arts, the Urban Choreography design concept will connect Jones Plaza to its surrounding environment while creating a unique and artistic space for gathering. The vast plaza is reminiscent of a theatrical stage, where various steps and levels culminate to a plateau of lush green space. The expansive Street Theater, tree-filled Gateway Gardens, and dynamic Spring Stage, characterized by water cascading toward the street, can be found in three corners of the plaza. Each distinct space is connected by a proscenium walk, with multi-functional media towers that allow for various performances, activities, and special events. Meanwhile, a grand staircase and elevator connect the park to an upscale restaurant on Capitol Street. Perhaps the most substantial impact Jones Plaza can have on its surrounding environment is its ability to attract people to the heart of Houston's Theater District. Its presence will only heighten the cultural growth of a region known for its art, creativity, and diversity. RCHS will collaborate with Houston First Corporation, the City of Houston, and Theater District stakeholders on the project. 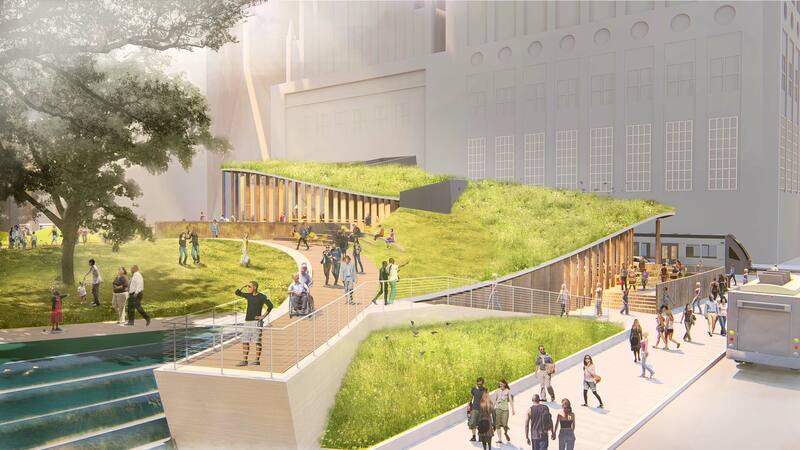 L.A.’s Board of Supervisors has approved a $40 million plan by Rios Clementi Hale Studios (RCH) to renovate Music Center Plaza, a raised outdoor space in the heart of the city’s cultural complex. Similar to New York's Lincoln Center, the Music Center, designed by Welton Becket and Associates between 1964 and 1967, is a Modernist acropolis for the performing arts. The now-defunct landscape architecture firm Cornell, Bridgers and Troller designed the fountain-filled plaza itself, working together with Becket on a plan that would defer to the original buildings and serve as a central gathering space between the Music Center's three theaters. While it’s an iconic piece of the city’s development on Grand Avenue, the plaza hasn’t been renovated since it opened. RCH’s plans will ease access, increase capacity from 2,500 to 5,000 people, and add programming. The plans will widen and flatten the facility's main entry from Grand Avenue, add escalators from the street, and raise the plaza’s sunken portion. The Jacques Lipchitz–designed Peace on Earth sculpture, currently located in the center of the plaza’s fountain, will be moved west to allow for more continuous use of the space between the Dorothy Chandler Pavilion, the Ahmanson Theater, and the Mark Taper Forum. 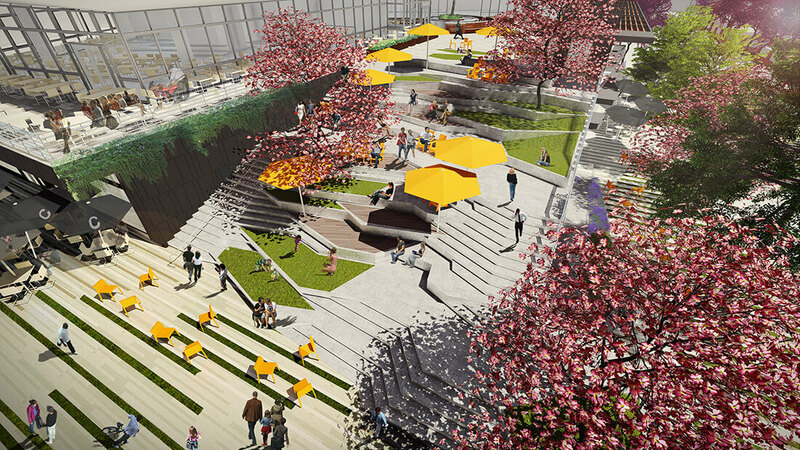 Landscaped vistas will overlook Grand Park (also designed by the Los Angeles firm) on the eastern end of the plaza. "The Music Center was originally oriented toward Hope Street, but Grand Avenue is really its front door now. We needed to reflect that," said RCH Senior Associate Naseema Asif. Five new buildings on the site will include a restaurant, wine bar, coffee house, welcome center, and permanent restrooms. It remains to be seen how all this new development (and the raising of the plaza's recessed portions) will fit into the overall aesthetic of the Music Center, but Asif notes "they are all single story, simple massings with really tight material palettes that relate to the plaza." Funding for the project will include $30 million from the Board of Supervisors and $10 million from the Music Center, whic has raised $6.8 million for the renovation thus far. Becket, little-known outside of Los Angeles, designed many of the city's most important structures and complexes, including Capitol Records, The Beverly Hilton, the UCLA Campus Plan, the Century City Master Plan, and Parker Center, the former L.A. Police Headquarters that's now slated for destruction. 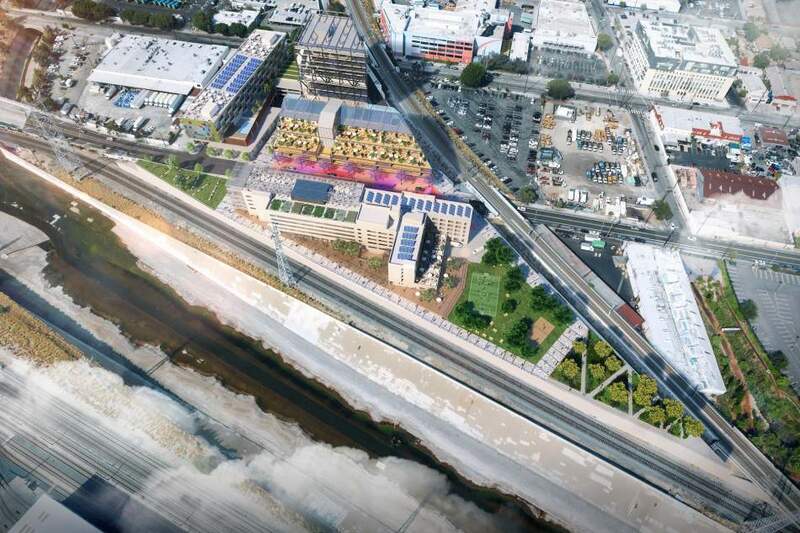 A team led by Rios Clementi Hale Studios (RCH Studios) and developers Lincoln Property Company and Fifteen Group has been recommended by the Los Angeles Chief Legislative Analyst to redevelop the Los Angeles River–adjacent Lincoln Heights Jail. The recommended scheme calls for repurposing the 90-year-old jail facility while also redeveloping an adjacent 3.2-acre parcel already controlled by Fifteen Group, Urbanize.la reports. The new scheme will be anchored around the Los Angeles River and the historic complex, utilizing the river frontage to create a broad promenade that stitches together new and historic buildings with the river. The plan incorporates new bicycle infrastructure and new street trees to connect and improve the surrounding blocks. Though project details are subject to change, the proposal currently calls for 268,250 square feet of residential spaces, 200,000 square feet of commercial uses, and 57,000 square feet of designated manufacturing and retail spaces. The project is slated to contain an unspecified amount of affordable housing. 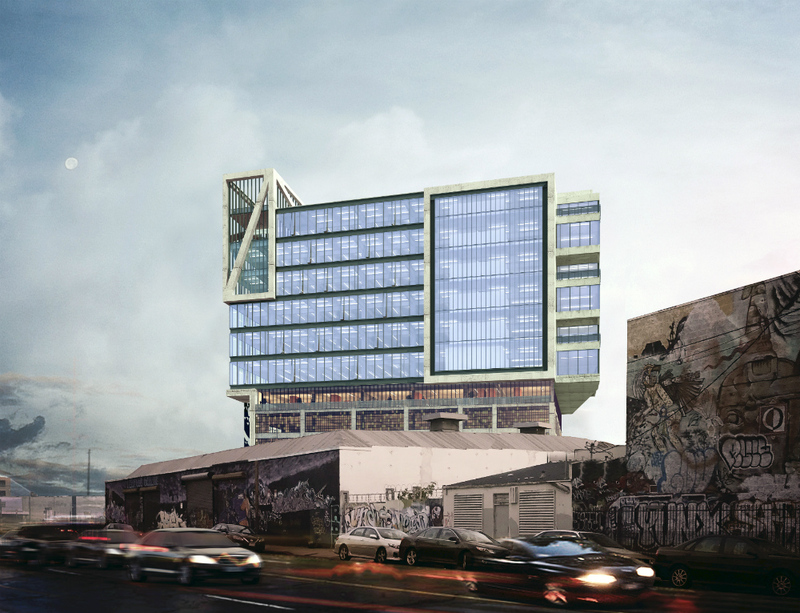 The RCH Studios–led development team was selected from among two other proposals—one led by CIM Group, Lorcan O'Herlihy Architects, LA Más, and Superjacent, and the other made up of WORKS, Mia Lehrer+Associates, Omgivning, and Killefer Flammang Architects. The teams were tasked with finding a productive and equitable approach for redeveloping the 229,000-square-foot art deco and modernist jail complex. The former jail was built in 1927, expanded in the 1950s, and finally decommissioned in 1965. The facilities were used variously thereafter until 2014. Plans call for adding three new structures on the eastern edge of the site to create new housing and a commercial strip, while redeveloping the former jail complex into a manufacturing-focused “makers hall.” The top three levels of the repurposed jail will contain residential functions as well. The project site would be anchored on one end of the riverwalk by a sports field, with a terraced amphitheater occupying the other extremity. The far eastern corner of the triangular site will host a nine-story commercial tower. The project is depicted in renderings as containing various roof gardens and planted areas, with the spaces between the existing and proposed buildings designed as pedestrian paseos. Interior renderings for the residential units in the repurposed jail depict exposed concrete beam ceilings and untreated concrete walls and columns. The project is scheduled for review and approval by the Los Angeles City Council on November 1st. The dilapidated and boarded-up Lincoln Heights Jail—a five-story, 229,000-square-foot art deco and modernist complex adjacent to the Los Angeles River—is on the verge of transformation as L.A. City Council officials prepare to implement redevelopment plans for the three-acre site. Sandwiched between Downtown Los Angeles and the city’s economically-stressed Eastside neighborhoods, the shuttered complex is one of the city’s most prominent historic landmarks. The triangular site sits in the city’s Cleantech Corridor and is written into the Cornfields Arroyo Seco specific plan as well. Those designations help poise the site for the type of high-end industrial redevelopment that is currently remaking the nearby Arts District while also threatening nearby communities with displacement. The jail was built in 1927 and was designed to hold 625 prisoners, though by the 1950s, it imprisoned more than 2,000 individuals, according to the Los Angeles Conservancy. Because of overcrowding, it was expanded in 1953 with a modernist wing. The jail has played an important role in the city’s history, holding individuals arrested during the Zoot Suit Riots of 1943 and the Watts Riots of 1965, for example. Individuals who had been arrested over suspicions regarding their sexual orientation were also imprisoned at the Lincoln Heights jail, which even contained a separate wing dedicated to incarcerating gay prisoners. The jail was decommissioned in 1965 and became vacant in 2014. Currently, developers CIM Group, WORKS, and Lincoln Property Company are each vying for the opportunity to remake the site. Developer CIM Group has proposed redeveloping the site as a mixed-use district called “The Linc” containing offices, housing—including multifamily and low-income units—retail shops, restaurants, and a community garden. The proposal calls for converting the art deco portion of the structure into a hotel with a rooftop restaurant. The 1953 addition would be converted to residential use while a triangular structure on the far end of the site will contain a single story of retail programming. 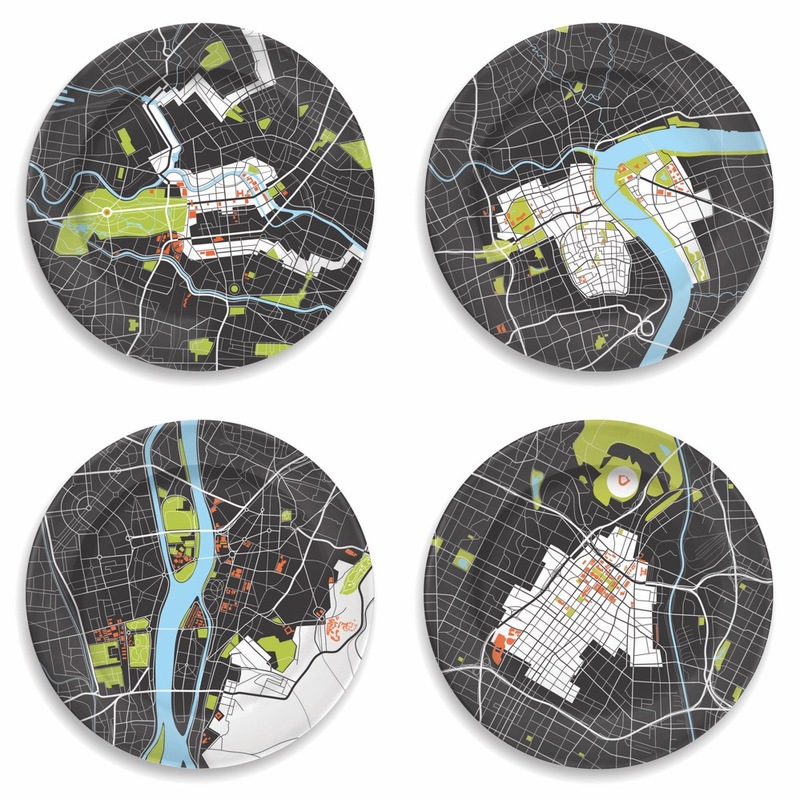 CIM has partnered with architects LOHA, LA Más, and landscape architects Superjacent for the proposal. Nonprofit housing developer WORKS—Women Organizing Resources Knowledge and Service—is looking to re-envision the site as a community-driven enterprise called “Las Alturas.” The complex would include 122 housing units, including 66 permanent supportive housing and 47 moderate-income homes. The proposed complex would also include a community center, child care facilities, theater, and generously-landscaped areas designed by Mia Lehrer + Associates (MLA). Mia Lehrer, principal at MLA explained to The Architect’s Newspaper that the WORKS-led proposal represented “the kind of community-focused investor you imagine exists but you don’t get meet very often,” adding that the design team included partnerships with Cal Poly Pomona’s agriculture program, and architects Omgivning and Killefer Flammang Architects. A third proposal by Lincoln Property Company, Rios Clementi Hale Studios, and Fifteen Group is also on the table. That scheme—called the Lincoln Heights Makers District—calls for a commercial- and manufacturing-focused district containing four acres of open space. The plan includes 268,250 square feet of residential space, including an affordable housing component; 220,000 square feet of commercial space; and 57,000 square feet of manufacturing and retail spaces. The designers envision repurposing the existing jail facility as a manufacturing center with associated housing and commercial spaces located alongside. The project has been proposed by the developer as part of a larger scheme that includes an adjacent, privately-owned 3.2-acre site that will contain live/work spaces. 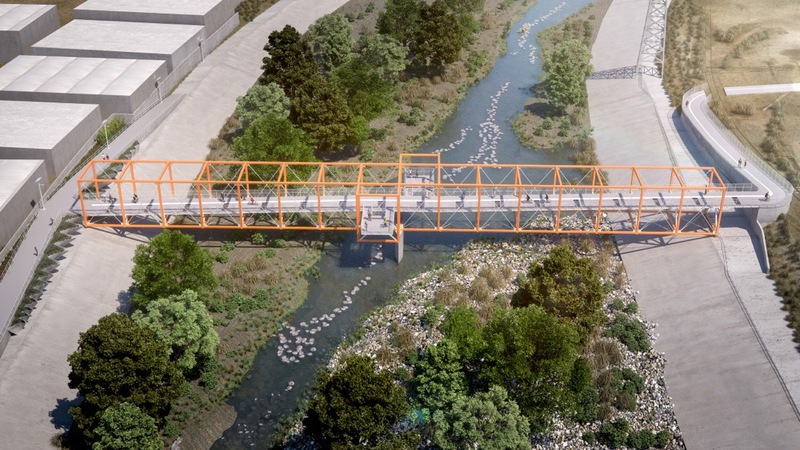 The proposal would include connections to the L.A. River as well as outdoor community-oriented leisure and work spaces. The schemes are currently being vetted by the City's economic development committee before heading to the full City Council for consideration. The City Council is expected to decide on the proposals as soon as this fall. 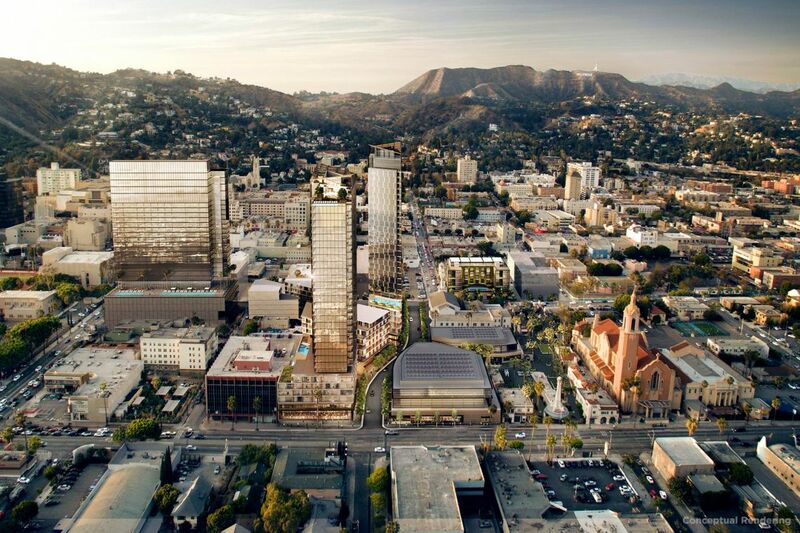 International firm SOM and L.A.-based Rios Clementi Hale Studios (RCH) have released new renderings depicting the firms’ massive redevelopment of the historic Crossroads of the World complex in Hollywood, California. The 1.43-million-square-foot project, currently pegged to cost between $500 and $600 million to develop, aims to repurpose, update, and expand the Crossroads of the World complex by adding a collection of new programs and several high-rise towers. Crossroads of the World was designated as a City Cultural-Historic Monument and was designed in 1936 by architect Robert V. Derrah as the region’s first outdoor, mixed-use office and shopping complex, according to the Los Angeles Conservancy. The complex, which features a collection of squat, streamline, Spanish-, Moorish-, and French-Revival style structures, will be joined on surrounding blocks by a group of high rise towers and mid-rise podium structures. Overall, the so-called Hollywood Crossroads project aims to add 950 housing units, 94,000 square feet of office space, and 185,000 square feet of commercial uses to the roughly eight acre site. The project features a trio of towers, including a 26-story hotel tower containing 308 rooms, a 30-story tower with 190 condominiums, and a 32-story tower containing 760 units, including the podium levels. The project’s site plan features a diagonal paseo cutting through the site that connects the Crossroads of the World complex with the new housing towers. The paseo is lined with ground floor retail uses overlooked by apartment balconies. The generic-looking, glass-clad housing and hotel towers rise from these integrated lower levels, according to the renderings. Sunset Boulevard, via a collection of new—and controversial—high rise developments, is in the midst of becoming a new vertical spine running through Los Angeles. The Hollywood area, in particular, is seeing a rush in high-rise construction, as developers scramble to meet an insatiable demand for new housing. These projects, however, have run into problems, as the new density has rankled local residents hesitant to see their neighborhoods change. 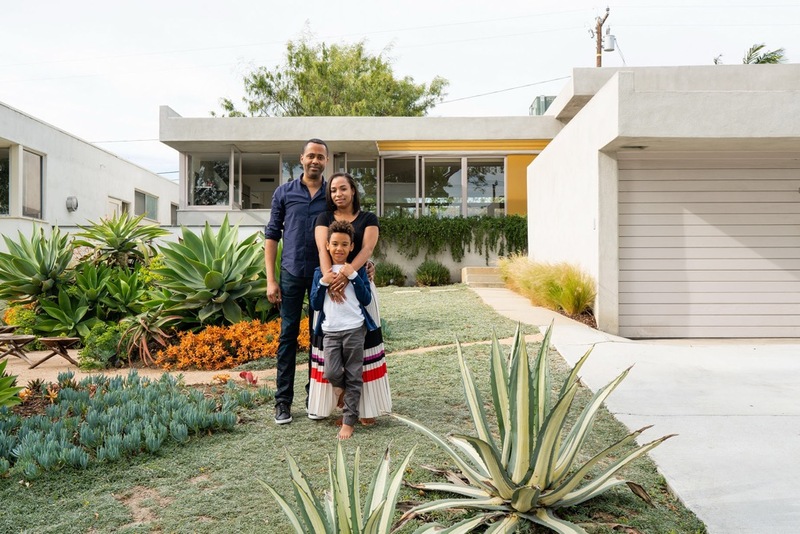 Projects like Natoma Architects’ Palladium Residences and Frank Gehry’s 8150 Sunset in nearby West Hollywood have drawn the ire of local residents, for example. David Schwartzman, chief executive at Harridge Development Group, however, is unfazed by the potential controversy. The developer behind the project told the Los Angeles Business Journal, “In Hollywood, you always have issues with projects and people complaining, but we’re following the rules.” He added, “We’re not doing a general plan amendment, we’re providing affordable housing. We’ve thought about the needs of the community. At the end of the day, you’re not going to make everybody happy.” The recent completion of RCH’s Columbia Square—another tower-over-historic-complex project developed a few blocks east of the Hollywood—has been met with praise, so perhaps there is hope yet for this project. Harridge aims to complete construction on the project by 2022, though an official construction timeline for the development, has not been released.